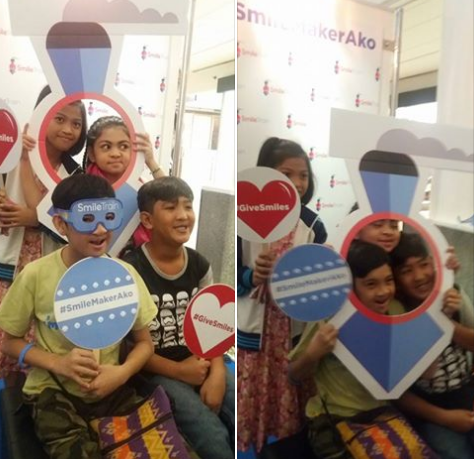 Smile Train Philippines is holding its #SmileMakerAko photo exhibit at Glorietta 3 Makati that runs up to Sunday. It has partnered woth Ayala Malls to showcase what Smile Train has achieved---how the cleft charity has given more than one million children worldwide new smiles and second chances at life. This week-long all-smiles photo exhibit also celebrates some of the moments the cleft charity has had with its supporters, referred to as "Smile Makers." Photographs of local Smile Train celebrity ambassadors Marian Rivera and Pia Alonzo Wurtzbach with child beneficiaries are on display at the exhibit. Pediatricians, patient care staff, among other healthcare professionals, are featured as well. One of the notable Smile Makers is Angel, a former Smile Train patient who is now a nurse volunteer. "We continue to raise awareness about cleft lip and palate in the Philippines, and how Filipinos can help give children with clefts a chance to smile through this #SmileMakerAko exhibit," says Flaviano. "Our goal is to reach out to more Filipinos and encourage more people to join in and be a Smile Maker by showcasing to the public the Smile Makers we have on board." The Smile Train is an international children's charity which provides training, funding and resources to empower local doctors in the developing countries to provide 100% free cleft repair surgery and comprehensive cleft care in their own communities. In the Philippines, it has facilitated over 450,000 life changing cleft repair surgeries across the country and trained 100++ cleft surgeons. Visit smiletrain.org to learn more about Smile Train's sustainable global efforts and how to make a donation. Follow @SmileTrainPh on Twitter and Instagram for updates.